If you own a USB-C device, you really need a power bank that can provide the full 3-amp output, but at the moment there is not as much choice as you would think. There are tons of power banks which use Quick Charge 2.0 technology, this of course will allow many of the latest smartphones to charge faster than when using chargers without this technology, but for 2016 this is not good enough! This year more and more devices are being launched which are adopting USB-C as the new standard which will eventually replace the current Micro-USB standard on phones and tablets. The latest USB-C-compatible devices include the Nexus 5X, Nexus 6P and, Google Pixel C tablet, OnePlus 2, Xiaomi Mi 4C, Chromebook Pixel, Nokia N1 and the 2015 MacBook. We have reviewed 3 of the best USB-C powerbanks below, though it has to be said that the competition at this stage is hardly fierce! 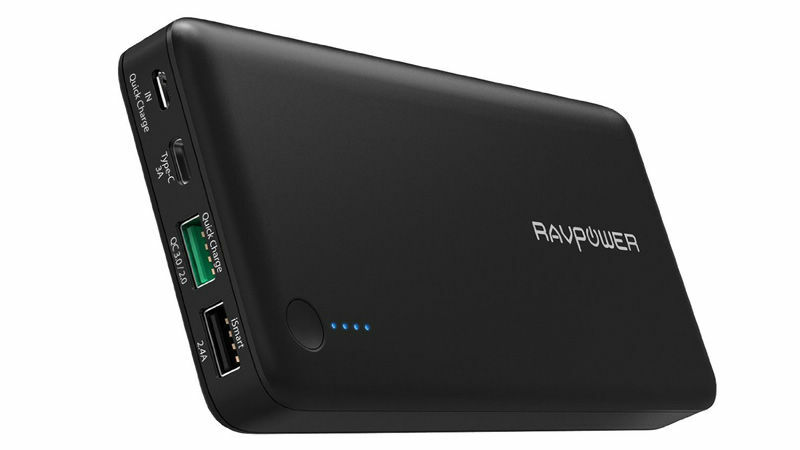 This latest power bank from RAVPower offers an impressive 20100mAh capacity and comes loaded with a USB-C input/output as well as Qualcomm Quick Charge technology. On the front of the device there is a Micro-USB input, a 3 Amp USB-C input/output, a Quick Charge 2.0/3.0 output, and a standard 2.4-amp USB output. The manufacturer claims that Qualcomm Quick Charge technology compatible devices will charge up to 75% faster. However, even mobile devices which are not Qualcomm Quick Charge compatible, such as the iPhone and iPad, still get up to 2.4A of current for rapid charging. The Anker PowerCore+ is a sleek 20100mAh capacity device with two USB ports rated up to 6A, but which will still offer 2.4 amps for non-USB-C devices. This unit does not support Quick Charge technology, but is powerful enough to offer quick charging t most devices. The PowerCore+ comes with a 24-inch USB-C to USB cable for charging the power bank and everything fits into a neat travel pouch. Without Qualcomm Quick Charge technology, this device is best-suited for USB-C devices that can accept its full 3 amp potential. This super-fast USB-C power bank was the first power bank to support a USB-C connection for charging mobile devices and has a fast maximum output of 4.2A and can even charge the new Apple MacBook. The device sports has a USB Type-A port as well as two USB Type-C ports and so can charge multiple devices at once. Utilising the new USB Type-C port, Maximas claim the Xtron will charge your mobile devices faster than any other power bank on the market today.